In convincing fashion UMass picked up just its second win in program history over a top ranked team. Alex Berry scored two goals against the Terriers who had only lost once previously on the season and would go on to win the national championship. Paul Dainton had 30 saves in the winning effort. It was the program’s first win over a #1 team since the miraculous victory over Maine in 1995. After beating #6 Notre Dame the day before in the first round of Lightning College Hockey Classic in Tampa, Florida UMass had to face #4 Colorado College in the championship. Things did not look good to start as the Tigers went up 2-0 after the first period, but UMass answered with three goals in the second. 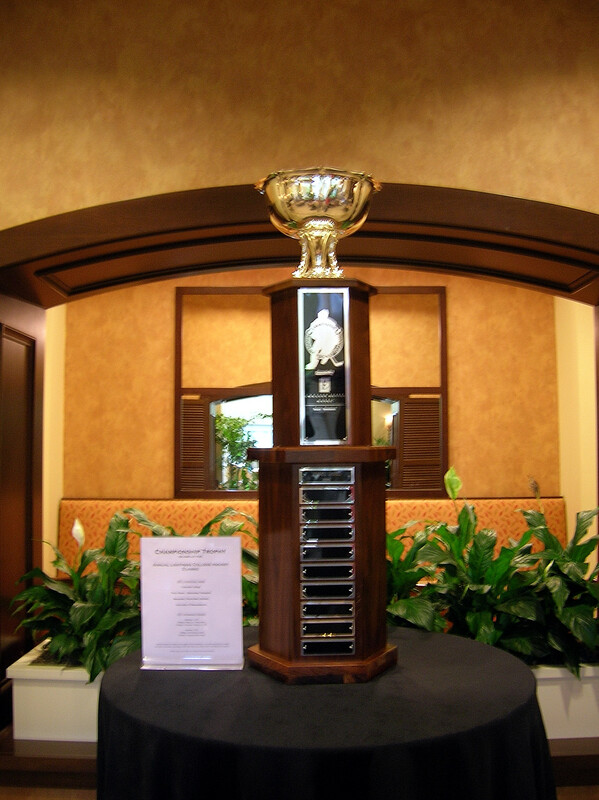 The teams would trade goals from there on out and find themselves tied at the end of regulation with the tourney trophy on the line. But two minutes in Matty Burto, who had a knack for providing game winners in his UMass career, stepped up and put a rebound in the back of the net as UMass captured their first ever tournament title and found themselves ranked #5 when the polls came out the following week. After only winning 8 games in both of the previous seasons UMass had already matched that total by December of 2002. But the Minutemen needed a signature win to prove to themselves and the rest of Hockey East that things were changing in Amherst. In came BU to the Mullins, a team that had owned UMass since the program had been reinstated. Things looked dire when BU had a 4-1 lead halfway through the game but the Minutemen setup a thrilling end by scoring the next three unanswered. In overtime Chris Capraro poke checked the puck away, screamed into the BU zone, and put the puck past Sean Fields, all while being tripped from behind, to show that UMass truly was changing the direction of Hockey East. That victory over BU helped propel UMass to their most successful season in Hockey East to date but their reward was a trip to Orono, Maine to face the 4th ranked Black Bears in the quarterfinals. UMass surprised Maine with a 5-3 win in the opening night and then shocked them by jumping out in the second game 3-0 in the first period, chasing Jimmy Howard from net. The Minutemen were able to hold on to the lead after that thanks to some solid play from Gabe Winer and with a 4-2 advanced to the FleetCenter and the conference semifinals for the first time in program history. UMass found themselves down 2-0 early in this game as well, but after that it was all Minutemen. UMass got goals from that season’s stars like Tommy Pöck and Greg Mauldin but this show belonged to the Warner brothers. Tim Warner was filling in for an inured Gabe Winer and ended up with 27 saves, including 15 in the 3rd p eriod alone. Mike Warner only scored 20 goals in his entire career but scored two in this one as the team advanced to its first ever Hockey East championship game. The team’s prospects for its first ever NCAA bid looked dim after UMass lost to UNH in the conference semis and news came of Quinnipiac jumping out to a 2-0 lead in the ECAC championship which would leave the Minutemen on the outside looking in of the pairwise rankings. 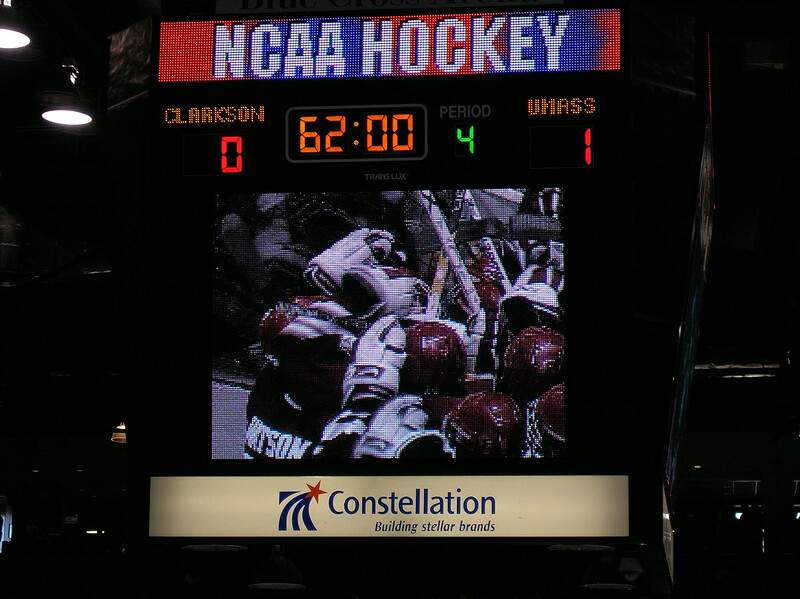 But Clarkson scored the next four goals in Albany and with it secured themselves a #1 seeding in the East Regional and a matchup against the UMass team they helped invite to the party. The game was dominated by goaltending as Jon Quick and Clarkson’s David Leggio combined for 68 saves in regulation. But in overtime it was all about retribution. Kevin Jarman was just a freshman in 2003 when his skate in the crease disallowed a Greg Mauldin goal in the Hockey East championship against Maine. But as a senior he scored the biggest goal in UMass history when he put back a Jordan Virtue rebound 7:40 into overtime to give UMass its first ever NCAA tournament victory, the pinnacle of the program to date. Despite only playing three seasons Mauldin’s 48 goals is the second most in the decade and sixth all time in UMass history. Mauldin was honorable mention All-Hockey East in 2002-03 and became just the second UMass hockey player to play in the NHL. Just two and a half seasons into his UMass career Marcou’s 105 points is the third most in the decade and already 6th overall in team history. Marcou was an All-American last year as well as All-Hockey East. Werner scored the most points and most goals of any UMass player in the decade. He’s fourth all-time in both categories. Braun has emerged not only as one of the better defensive defensemen in the conference, but in all of college hockey. He was second team All-Hockey East last season. Pöck’s numbers are tops for UMass defensemen. Pöck was a Hobey Baker Finalist, twice named All-Hockey East, won INCH’s Defenseman of the Year, and played in both the NHL and the Olympics. Quick averaged nearly 29 saves per game in his career, tops for all UMass goaltenders. Posted a goals against of 2.16 in 2006-07 and was named an All-American. Honorable Mention: Marvin Degon, Paul Dainton, Mike Kostka, Cory Quirk, Nick Kuiper, Matt Anderson, Mark Matheson. College Hockey News has a preview of the holiday tournaments.